Last lesson, we learned about a woman who had been bleeding for 12 years. When she touched Jesus, He was actually on His way to see a little girl. This little girl was 12 years old, and she was very sick. Her father’s name was Jairus. He was a synagogue leader — a ruler of the synagogue. Even though he was an important man, when his daughter was sick, he knew that only Jesus could help. Jairus knew that Jesus had the power to heal his daughter, and he believed that she will be healed. This is called faith. Jesus went with him. Along the way, He was “interrupted” by the woman who was bleeding for 12 years. For Jairus, it must have an anxious time because Jesus stopped to talk to the woman while his daughter was dying. But perhaps his faith was strengthened when he heard the woman’s testimony. To these people, Jesus was just a “teacher”. Jesus brought Peter, James and John with him to Jairus’ house. At the house, there were many people crying and wailing loudly. But the people laughed at him. Jesus put the people out of the house, leaving only his disciples and Jairus and his wife. They went into the room where the girl was lying. Immediately, the girl stood up and began to walk around. Jesus told those present not to let anyone know about this and to give the girl something to eat. When the woman who was bleeding interrupted Jesus, when the people from Jairus’ house told him that his daughter was dead, when the wailers and mourners were crying in the house … despite these circumstances, Jesus still called Jairus to believe in Him. Jesus is Life. Jesus gives Life. Jesus is Lord over everything, even death! Jesus’ life is in us, and we are Jesus’ boys and girls. When we believe in Jesus, we can enjoy this eternal life with Jesus even now. Death is not the end. Even when our physical bodies give way, we can still enjoy this life forevermore. Let’s pray: Thank you Jesus that when we are faced with difficult situations, You are there with us. When things seem hopeless, You call us not to fear and to believe in You. Help us to learn to trust You more each day and to speak life and faith, according to Your promises. In Your name, I pray Amen. We are Jesus’ beloved children. We can receive Jesus’ life when we believe in Him. Print out the pix below on card/paper. Get kids to colour. Help them to cut out the holes for the fingers to go through as the girl’s legs. 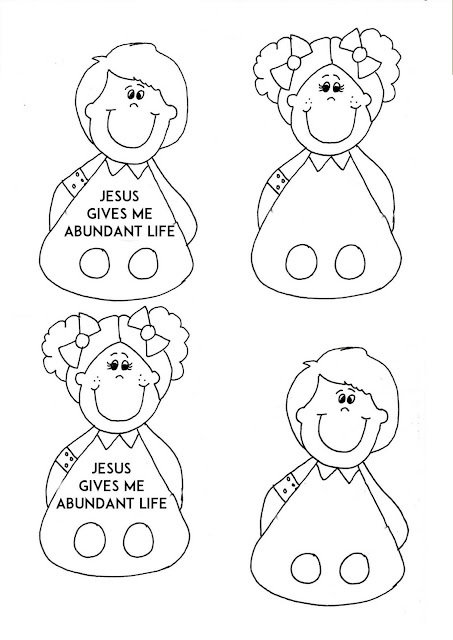 “Jesus came to give me abundant life (John 10:10)” on the dress.